Thatched Cottages01621 784621work01621 784621fax Self-cateringSituated close to the railway station with direct trains to London taking just over an hour. 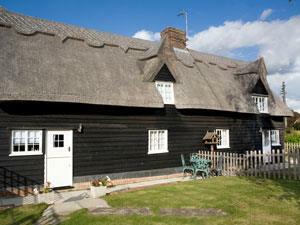 These traditional thatched cottages are set in their own gardens. Award winners in the Conservation & Design Awards 2009 for their "sympathetic and dedicated" renovation. They are very well equipped for holiday makers. There is private parking. There is an outside drying area as well as a tumble dryer. There is a shed for storing/drying sailing gear or bicycles. No 1 has a double bedroom and a twin bedded room upstairs. The shower room is downstairs along with an open plan kitchen/lounge/dining area. No 3 has double bedroom with en-suite bathroom. It has a separate kitchen and lounge downstairs. They are oozing original features and give an insight to life in the 16th century. As they are semi detached properties with connecting gardens they are ideal for a group of family or friends holidaying together. Burnham is a great place for sailing, walking, cycling, golfing and riding. There are some lovely restaurants and cafes and a cinema. For those wanting to relax venture no further than the gardens with your book or to enjoy the wide variety of shrubs and flowers. Situated close to the railway station with direct trains to London taking just over an hour. These traditional thatched cottages are set in their own gardens. Award winners in the Conservation & Design Awards 2009 for their "sympathetic and dedicated" renovation. They are very well equipped for holiday makers. There is private parking. 2 Play for the Price of 1 Golf Offer!. The cottages are very well sited and within 5 minutes drive from golf course, marina, leisure club and the town. They are opposite the Farm Shop offering fruit, veg, eggs and honey. There is a supermarket only a short walk away. Children welcome from any age. Burnham on Crouch is situated on B1010 which connects to A130, leading to A12, A13 and M25. The cottages are on the Burnham to Southminster Road. At Eves Corner. Once you arrive at T junction it is right for Burnham Centre and left to cottages. From London Liverpool Street, the Southminster Line stops at Burnham. Only a short walk to cottages. There is a bus stop nearly outside. Buses come fro, Chelmsford and Maldon.